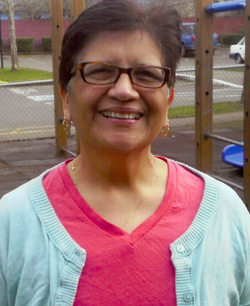 Connie Garcia was the Democratic candidate for Oregon House District 20 in the 2006 election. Sean Wasson, Alyssa Penn, and Alexandria Westlund interviewed Connie Garcia at Western Oregon University in Monmouth, Oregon on Wednesday February 2nd, 2012. Connie Garcia is a strong believer in the rights of citizens, especially those of minorities. As a woman of Mexican American heritage, she knows first hand how difficult things can be. She campaigned for a better education system, one that did not leave children behind. Q: Please share your views on the importance of women’s vote. Q: What has been important in the past, and how does that relate to the present, with regard to women’s rights? Response: Connie Garcia never thought about politics or running for office because her father had a negative view of politics. His parents were part of the Mexican people who were repatriated in the 1930s. Garcia retired because she got tired of teaching in an education system that was eroding away. Her older children had a better educational experience than her younger children. The older ones got to have shop, and home economics. Year after year programs would go unfunded. She was an elementary school teacher that ended up teaching in the high school. She got tired of seeing kids pushed out and neglected, so she left teaching. She lived the retired life a while, until a friend suggested that she run for office. Q: Do the people that are running use their religion as a reason to get votes? Q: When did Hispanics get the right to vote? Q: Did you focus only on education during your campaign? Q: What has been the largest reward from running for office? Connie Garcia is a strong advocate for minorities having equal civil rights. Having a heritage as a Mexican American and growing up during the 1960s, she witnessed firsthand how difficult activism can be and how it also unites people of different races and sexes. Her story and history made her campaign unique. Her profession as an educator allowed her to see the administration of the educational system and also its many flaws. Due to this she stepped into the political world and campaigned for a better educational system, one that did not leave any children behind.